Does this seem familiar? Picture by Medic. Let’s face it. We hate Snipers. In every single Remove A Class thread on SPUF, the class that gets picked on the most is the Sniper. Despite his loud-mouthed insults, his only-just Australian accent and his ability to throw jars of urine around, people still despise the poor guy. It’s not his fault though, it’s just the way he was designed! The question is, why does everyone hate Sniper? Is it his bad accent? His lack of Mannliness? Finding five of them on a team of twelve? All those jars of urine? The Bushwacka? Not quite. 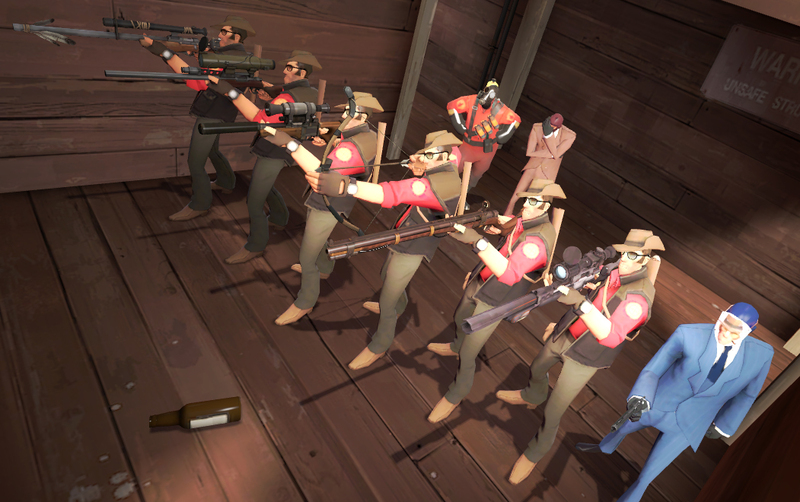 Team Fortress 2 is a close to mid-range game. Soldiers and Demomen do their best at mid range. Scouts, Spies and Pyros work best at close range. Snipers? They’re standing all the way over there, hiding behind a tractor, a pipe, a shed or, most annoyingly, behind a large metal door that opens and closes on demand. They’re completely outside the normal battle, but can so easily change it. They can kill you from a mile away. And the weapons they use can be downright annoying. But just HOW annoying are they? Everyone’s used to the Stock Rifle. It has no benefits or downsides. It’s been in TF2 since the beginning. That sort of longevity is probably what has made the pain go away. Being incapable of doing headshots makes the Sydney Sleeper (okay, fine, Piss Rifle) the laughing stock of Sniper’s Primaries. When it was part of the Croc’o’Style set, it’d cause immense anger, as its ability to jarate victims as well as the damn awful set bonus of “User cannot be killed by Headshots” would drive not just other classes, but other Snipers insane too. Nowadays though, people just sigh. Annoyance Rating: 0/10 – Can’t headshot. With its cool pewpew laser effect after filling up your Focus bar, you’d think you’d see the Heatmaker more often. Really, though, it’s more of a gimmicky stock rifle. No one really minds. Recently, the Bazaar Bargain (another victim of the BB Name Syndrome) somehow ended up with a bug that completely negates its downside. So it’s basically a direct upgrade if you’re a god-like Sniper. Thankfully, most Snipers aren’t god-like, so we’ve been spared. For now. Annoyance Rating: 6/10 – But only in really good hands. Bodyshot Rating: 1/10 – Don’t want to lose those heads, do we? Ah, the Machina. Extra damage when fully charged AND penetrating shots? Two silly upsides for the price of one! Because of damage spread, this damage bonus means it can accidentally take out Pyros and Demomen in one hit, and those penetration shots mean that hiding behind your teammates isn’t always a good idea. The horrific noise that plays when you score a penetrating shot just makes it even nastier. Annoyance Rating: 9/10 – That noise is horrible. And I was hiding behind my Heavy like a good Medic! The only projectile-based primary of the Sniper, the Huntsman lacks in a lot of areas. The only thing it’s really good for is spamming down choke points, tentative mid-ranged combat or Medieval Mode. Oh and the Skewer Taunt, the fastest tauntkill in the game, that stuns you utterly. At least the Haduken taunt is kind enough to let you run away. Bodyshot Rating: 8/10 – Spam, Spam, Spam! So there we have it. A completely unreliable, anecdotal report on why Snipers are annoying. Oh well. I love catching those arrows with my head on dustbowl. I am pretty good at it, apparently. Seriously though, I play as Sniper sometimes – and he’s the only true long-range class without requiring any unlocks.